At Gordon’s Sanitation Services we sell many products that can help you repair, replace, or install a septic system in your farm, home or business. Purchase a new tank or purchase important components like baffles, level controls, pumps and other hardware. We carry top of the line materials and equipment that will meet all of your septic needs. Contact us any time and our expert team can also help you to maintain these products. Building a home or business? Need a new septic tank? 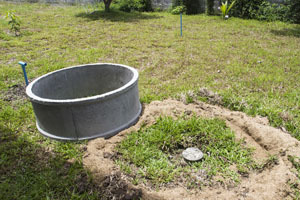 We provide fiberglass septic tanks to make sure you are getting the best for your needs. Fiberglass tanks provide a light weight without sacrificing strength or lifespan. With fiberglass you will never have to deal with rust, rot, or corrosion! Come to us to get a fiberglass septic tank in your home or business. Baffles are an important part of your septic tank moving the waste into the tank and preventing scum from reaching the soil around the tank. Much like fiberglass septic tanks, fiberglass baffles will control water flow without the risk of rust, rot, or corrosion. They are light weight and easy to install, which makes them great for new builds or remodeling. Fiberglass also eliminates any foundation cracking concerns you would face with concrete baffles. We carry float switches, level sensors and controls for your tanks and pumps. We will find the right products for your tank to optimize its efficiency and efficacy. These controls allow you to gauge wastewater levels in your tanks and prevent any leakage or malfunction. Let us help you maintain your tanks and systems with the right controls, sensors and professional assistance. Need to replace or a repair a septic pump in your home or business? We can help. We carry a variety of parts and sewage pumps to help you get what you need! Stop by our location to see how we can get your pump working the way it was meant to. Remember that, while we only sell quality product, they still need to be maintained by professionals. Give us a call and we will keep your septic systems functioning like new.